Calling all cat lovers. If you love cats, & kittens big and small you will appreciate the artistry of Bill Bell. He incorporates hundreds of kitties in his artwork. Just when you have stared at it for an hour you see another cat you didn't notice before. It makes you think.. Where's Waldo!! 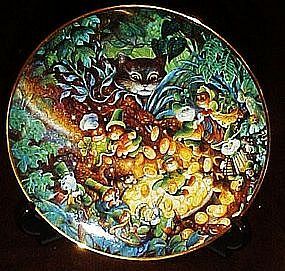 This one called St. Catrick's day is a St. Patrick's day themed plate with kitty leprechans (??? ), it measures 8 1/4" and has gold trim. Hand numbered limited edition complete with styro box and certificate of authenticity and small wood plate stand. Perfect condition. Exclusively Franklin Mint. Your Irish eyes will be shining with delight at this one!